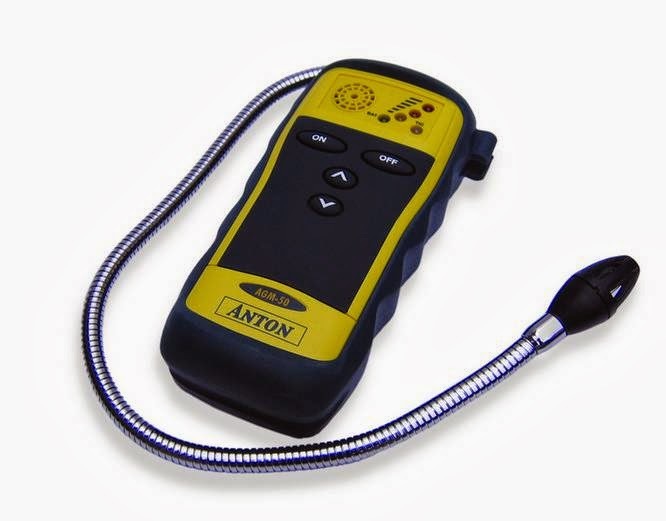 All good machines need sensors, and we are no different. Everyone is familiar with the five classic senses of sight, smell, touch, taste, and hearing, but we often forget just how amazingly finely tuned these senses are, and many people have little appreciation of just how complex the biology behind each sense is. In this week's post, I hope to give you an understanding of how one of our senses, smell, functions and how, in light of recent evidence, is far more sensitive than we previously thought. The olfactory system is an extremely complex one, but it is built up from fairly simple base units. The sense of smell is of course located in the nose, but more specifically it is a patch of tissue approximately 3 square centimetres in size at the roof of the nasal cavity that is responsible for all of the olfactory ability in humans. This is known as the olfactory epithelium and contains a range of cell types, the most important of which is the olfactory receptor neuron. There are roughly 40 million of these cells packed into this tiny space and their job is to bind odorant molecules and trigger neuronal signals up to the brain to let it know which odorants they've detected. They achieve this using a subset of a huge family of receptors that I've written about before, the G protein-coupled receptors (GPCRs). These receptors are proteins that sit in the membranes of cells and recognise various ligands (i.e. molecules for which they have a specific affinity) and relay that information into the cell. There are over 800 GPCRs in the human genome and they participate in a broad range of processes, from neurotransmission to inflammation, but the king of the GPCRs has to be the olfactory family, which make up over 50% of all the GPCRs in our genome. There is nothing inherently different about how the olfactory GPCRs function relative to the other GPCRs: a ligand binds to the receptor on the outside of the protein, which causes it to change shape, which is in turn detected by other proteins inside the cell and so causes a response from the cell itself (if you're interested in learning more about this process, I suggest you read my earlier post here). In this case of olfactory GPCRs, this responses is the firing of the olfactory neuron via an action potential, which I have also written about before, here. Interestingly, this process also occurs with another group of sensory GPCRs - those found in your retina that detect light. The difference is that the visual GPCRs absorb a photon in order to change shape rather than binding a molecular ligand, but they are otherwise equivalent processes. So I guess there's little reason why we shouldn't say that we 'smell' light, or 'see' odours! 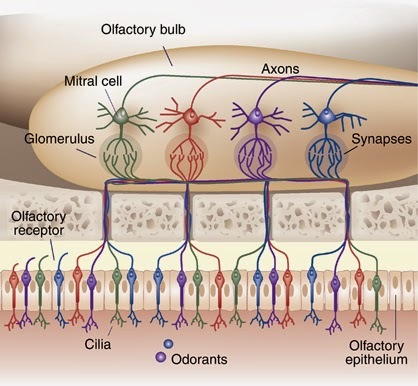 Although we have over 400 olfactory GPCRs, each olfactory neuron expresses only one type at its surface. This means that each neuron is limited to the detection of only a limited range of the odorants that could be detected by the system as a whole. This is important, as all the brain knows is that an individual neuron has fired, not what caused it. If each neuron expressed a whole range of olfactory GPCRs, the brain wouldn't know which one was responsible for activating it. Each olfactory neuron has only one type of olfactory receptor (represented here by different colours). These come together to form the olfactory bulb, in which signals from the different neurons get amplified and sent to the brain. Figure from Bomback & Raff (2011), Kidney International 80 (8). Interestingly, though, even though each neuron only has one type of receptor, it can recognise multiple similar odorant molecules. This is because the olfactory receptors have 'ligand promiscuity', which means that any individual receptor can bind to a range of ligands, and any individual ligand can be bound by a variety of receptors. This is possible because olfactory GPCRs bind their ligands more loosely than most GPCRs, and so can afford to be less specific in terms of their recognition. This seems to have been important in the evolution of a varied sense of smell, as being sensitive to a broader range of odorants is generally advantageous, but you can only have so many receptors and so this is a nice way of having increased breadth within a limited receptor profile. This is also why some things smell identical despite being different molecules - they bind the same receptors. The promiscuity of olfactory receptors. Multiple odorants can be recognised by one receptor, while one odorant can bind to a range of receptors. Figure from the 2004 Nobel Prize in Medicine presentation by Richard Axel and Linda Buck. The reason I chose to focus on smell in this post is because a study published in Science just this week has suggested that the range of odours that humans can distinguish is much, much broader than we previously thought. We humans have a habit of doing ourselves down - comparing our sense of smell to that of dogs or other animals and concluding that we are poor at best. This is an unduly glass-half-empty approach, since even though we may not all be bloodhounds, we are still pretty potent when it comes to olfaction. Until this week scientists had been working on the assumption that humans can distinguish between around 10,000 odours, although this was based on some fairly loose calculations made back in the 1920s when they didn't even really understand what olfaction was. 10,000 sounds pretty good to me, though it was revealed this week that we actually can discriminate between far more odours than that. And when I say 'far more' I mean a hell of a lot more - more like 1 trillion individual odours! The study that showed this is elegant in its simplicity and, helpfully, doesn't require any biological knowledge to understand. The researchers who undertook this just took 128 odorants and combined them in unique combinations of 10, 20, or 30 different compounds before getting people to try to distinguish them by smell - pretty simple! They found that people were generally pretty good at distinguishing odours (note that we're defining 'odour' here as the combination of individual odorant molecules in a given smell) if they varied by more than 50% of their basal composition. If you crunch the numbers for this, the total number of possible combinations of these 128 odorants that could be distinguished is an average of 1 trillion. This varies significantly between individuals, though, as their top smeller had the potential to distinguish a whopping thousand trillion odours, whilst the poor soul with the weakest sense of smell could only distinguish a pitiful 80 million. Nonetheless, we're well above the 10,000 that we were giving ourselves before this study! This study might seem like fluff science at first glance, but it actually has important implications for our understanding of how sensory signals are combined and distinguished as our brains are constantly bombarded by signals from our environment. Our ability to discriminate between such a broad range of possible odours (which, I would say, is probably broader than the actual range that commonly exists in nature) is probably the product of several levels of complexity within the olfactory system. There is the ligand promiscuity of the olfactory receptors that I mentioned earlier. This can then be combined with the variable expression of different olfactory receptors on individual olfactory neurons so that different neurons become activated to varying extents by different odours. Then there's how the brain processes the complex array of neuronal signals being transmitted to it from the nose, adding yet another layer of complexity to the system. Once all of this is considered, it seems naive to think that we could only distinguish 10,000 odours, we are far too complex machines for that! Just another example of how the human machine is constantly surprising us with is beautiful complexity, and another reason to stop and smell the flowers! A new cosmological coincidence problem?